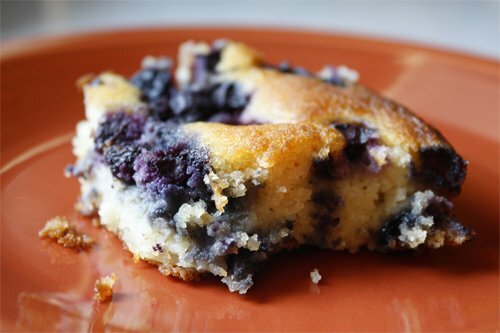 Blueberry Pudding Cake is a great “anytime” recipe for blueberries, using the incredibly yummy coconut cream concentrate known as coconut butter. It’s not the same thing as coconut oil. This is ground coconut meat, like almond butter! It’s available from Tropical Traditions or natural grocers. I use Honeyville blanched almond flour. The blanching helps remove some of the phytic acid that all nuts and seeds have, blocking absorption of certain minerals. Grains are seeds too and the phytic acid in grains is one reason why I don’t recommend eating them. That’s one basic rule of the Paleo Diet. Keep your almond flour in the refrigerator or freezer, tightly sealed, and use it while it’s fresh. If you open the bag frequently for small amounts, keep the larger portion of the flour in the freezer. This recipe is from the Tropical Tradition’s free recipe site where readers contribute recipes for anyone to use. Check it out if you don’t know it. I always read the comments below the recipes for tips from other cooks too. Enjoy! • Make sure all ingredients are room temperature. The coconut cream concentrate should not be melted, but spreadable. If it is hard, immerse jar in very hot water, let soften and stir well to mix. 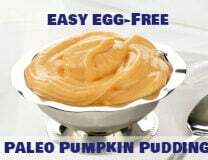 • Whisk together coconut cream concentrate, coconut milk, egg, honey, and vanilla in a large mixing bowl. • In medium size bowl, mix together almond flour, baking powder, and salt. • Slowly add dry ingredients to wet, whisking until combined. • Preheat oven to 375 degrees F and grease a 9 x 9 baking pan. I used melted coconut oil. Pour batter into pan and spread with a small spatula. Top with blueberries. (See next note if using fresh berries...) If using fresh berries, bring berries and juice to a simmer over medium heat on the stovetop. Once it bubbles gently, reduce the heat to low and simmer for 4-5 minutes until the mixture thickens. Pour over the cake batter. • Bake in preheated oven for 20 – 25 minutes. 20 minutes will give you more of a pudding consistency, whereas 25 minutes will get you more on the cake side. I like to split it down the middle and go for 22, but every oven is different. Cool and serve at room temperature, topped with whipped coconut cream or ice cream.